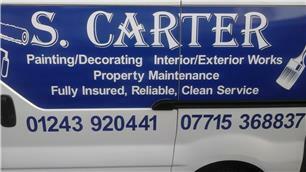 Hi welcome to S.Carter Painting and Decorating Services. I am a sole trader with over 30 years experience and can meet all your interior/ exterior decorating needs from painting, wall papering, feature walls, coving, architrave, boxing in of pipes, skirting, door hanging, ceramic tiling of walls and floors and plaster boarding. I deliver a friendly, reliable efficient service, payment on satisfaction of works. All works completed to the highest standard. Please feel free to contact me to discuss your individual needs and requirements. From Bognor Regis to......Brighton......Portsmouth.......Horsham........Crawley. All areas in between.